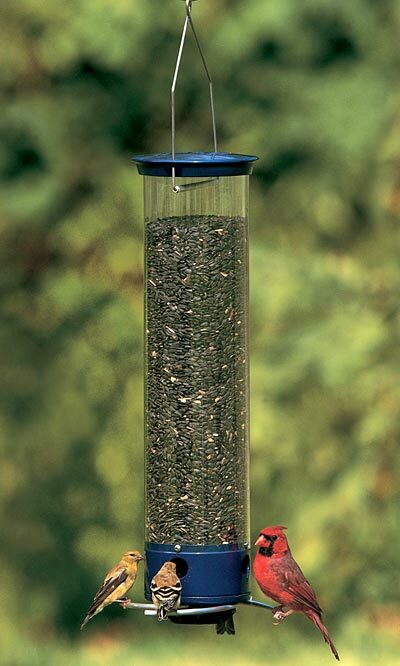 The Yankee Whipper is a squirrel proof and bird selective feeder. The Whipper features four seed ports with individual weight sensitive perches. The curved perch positioning encourages cardinals and small songbirds to eat, but hinders squirrels from feeding. Each perch is individually sprung and calibrated for birds up to the weight of a cardinal (approximately 2 ounces). The metal cap may prevent squirrels from reaching seed by lifting this feeder top. An internal baffle design keeps seed flowing freely to the ports. The clear feeder reservoir is made of UV stabilized polycarbonate for long lasting durability without yellowing. The cap and feeder base are evening blue powder coated metal. Hang the Whipper from its looped stainless steel wire for secure hanging and to reduce motion. Lifetime Guarantee. Note: A portion of the proceeds from the sale of this feeder will be donated to causes that support wild birds and their habitats.